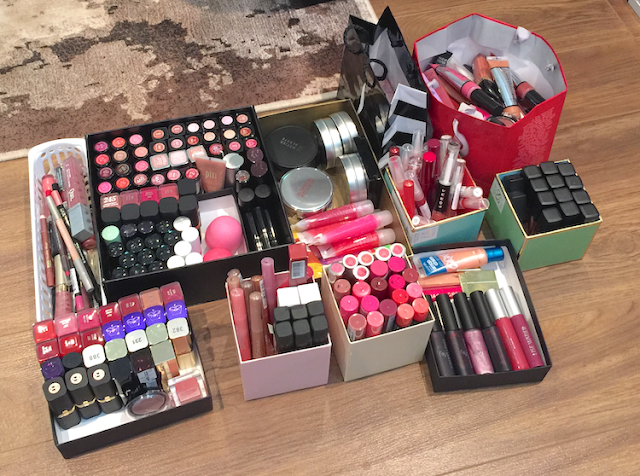 Since my last post on decluttering my lip products, I've gone ahead with all the categories in my collection. 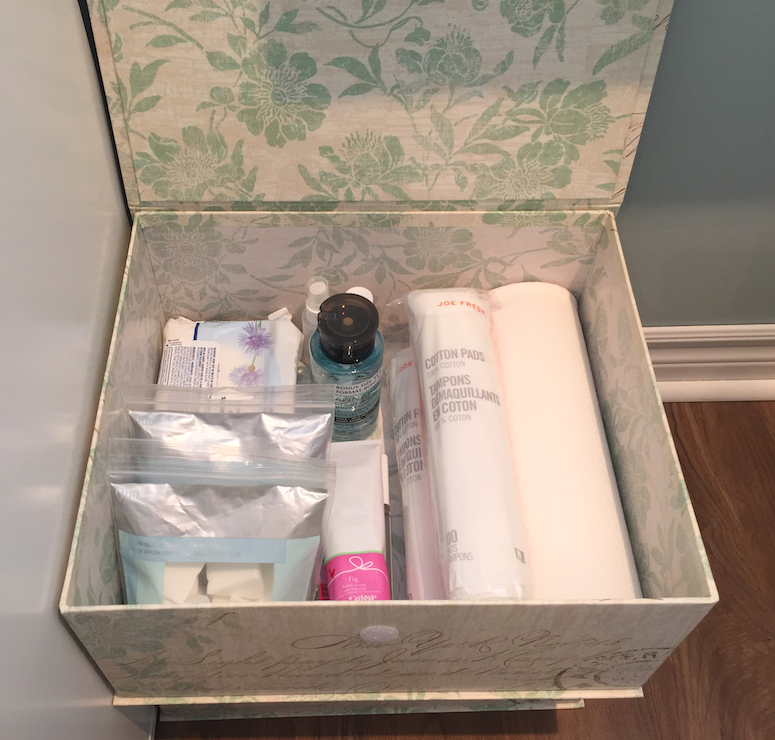 I knew, going through it, that it was only a preliminary declutter, and that I would really need to sit down and make some harder choices, but it was a good place to start. This is a quick overview of the result. One thing I've realized doing this de-clutter: I have a wildly inaccurate perception of my reviewing capacity. I've pulled out so many items that I purchased (often in multiple shades) with the sole intention of reviewing - and they're still sealed, mocking my intentions with their plastic-coated goodness. This is the pile of assorted lip products (glosses, stains, lipsticks) that are exiting my collection. I posted it on Instagram and got some lovely comments from people, very encouraging and congratulatory. 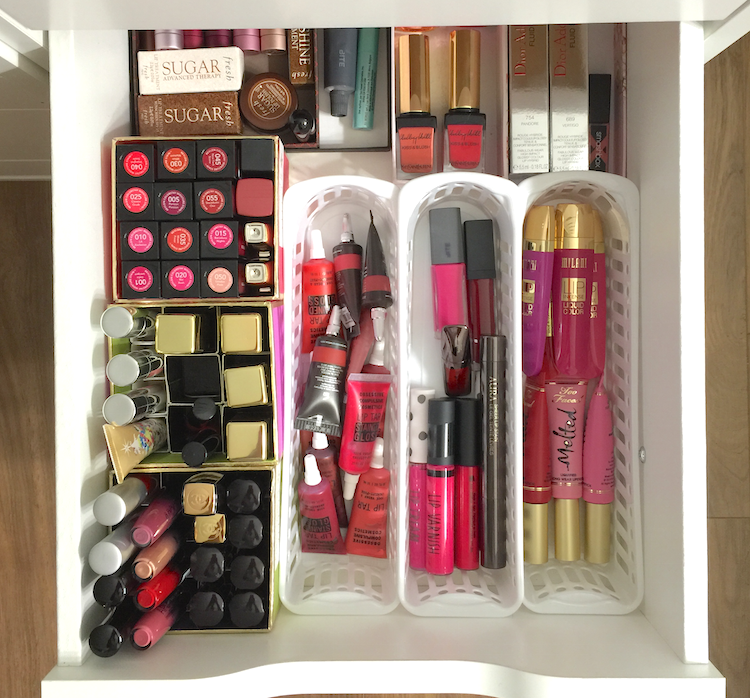 Which I really appreciated, since I was depressed about how much time and money I've wasted. Side note: those Fresh balms are my favourite, and have been for years, but Fresh is not currently CF. I welcome suggestions for an alternative, since balm is one of those staples that I will have to replace eventually. 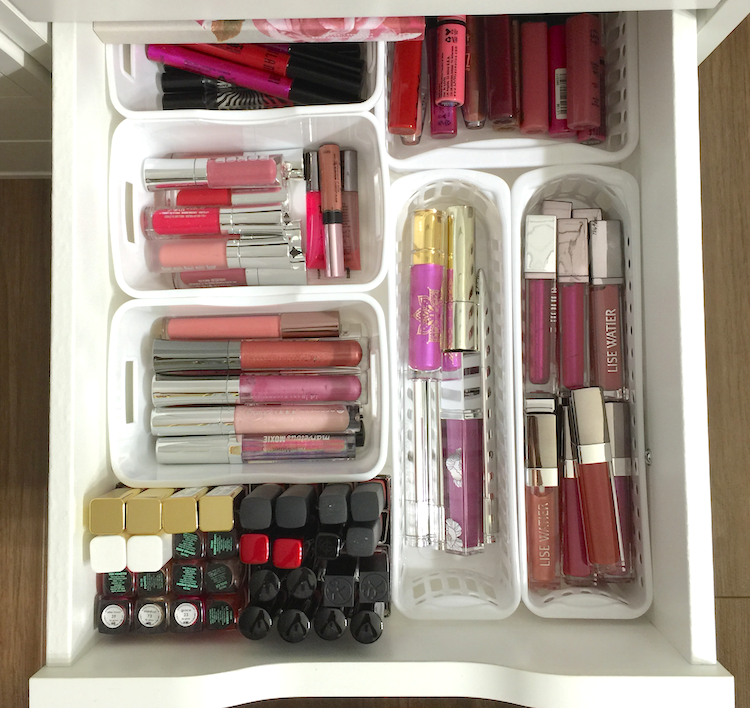 Oh god, the lipgloss. This is some serious goo, here. At least this was easy to parse out. Anything that was still sealed went into the potential sale/giveaway pile. A few things that were open but still new - and that didn't evoke a need to clutch it to my chest protectively - went into the "give it to my mom" pile. Then there where all the ones that earned a sketchy look during the smell test. Those went into the "toss it" red bag in the picture up top. And the non CF drawer. WHY DO I HAVE SO MANY OF YOU?? WHY MUST YOU BE SO ADORABLE IN YOUR LITTLE BULLETS AND PRETTY COLOURS? Also, is it time for wine? 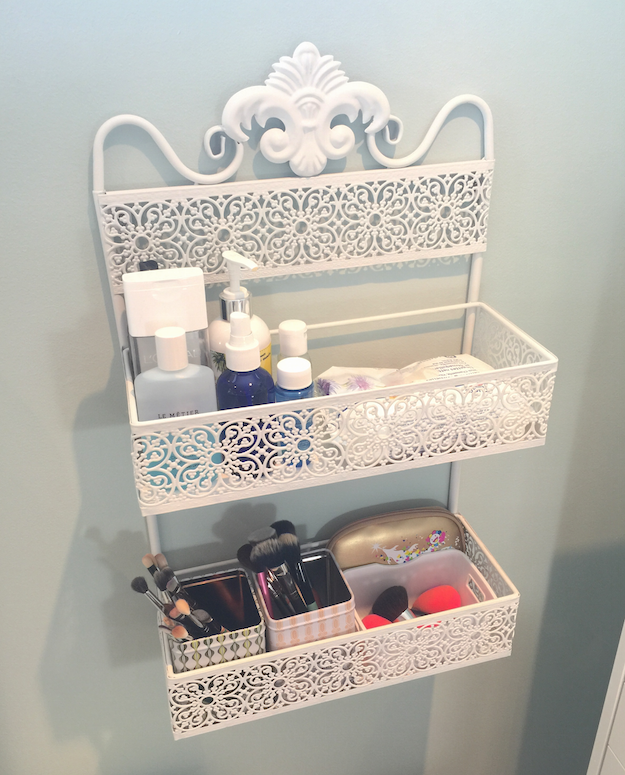 My first experience with primer was the classic Smashbox formula, and it turned me off primers for a loooong time. The thick texture and super slippy silicone texture felt strangely creepy and medical-grade (the product equivalent of Jeremy Irons in Dead Ringers *shudders*). Despite the way it disappeared once applied, my skin somehow still felt smothered. I've found others since then that I do love, and that are much more suited to my needs, but I'm still leery. 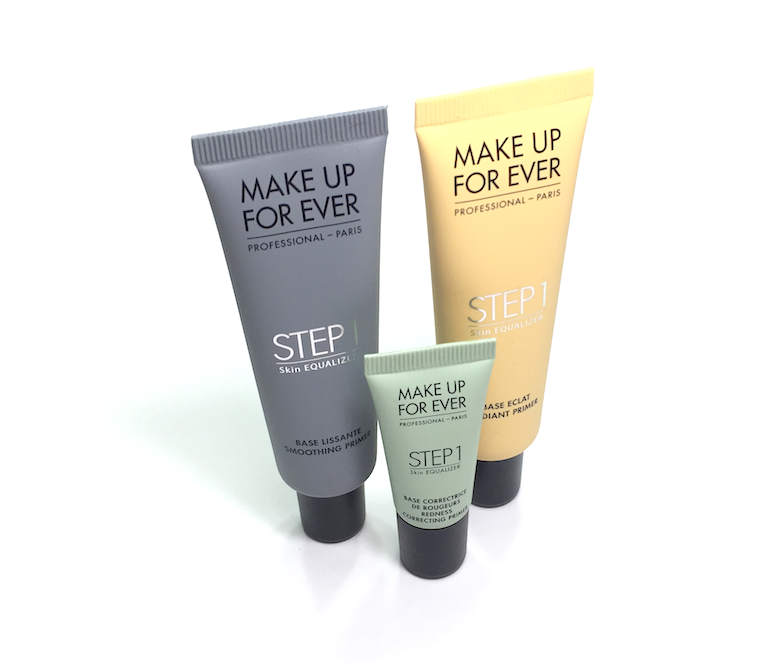 I also tried the old Make Up For Ever primers, and while they definitely had a more palatable texture - lotion-like rather than slippy - I can't remember being particularly blown away. 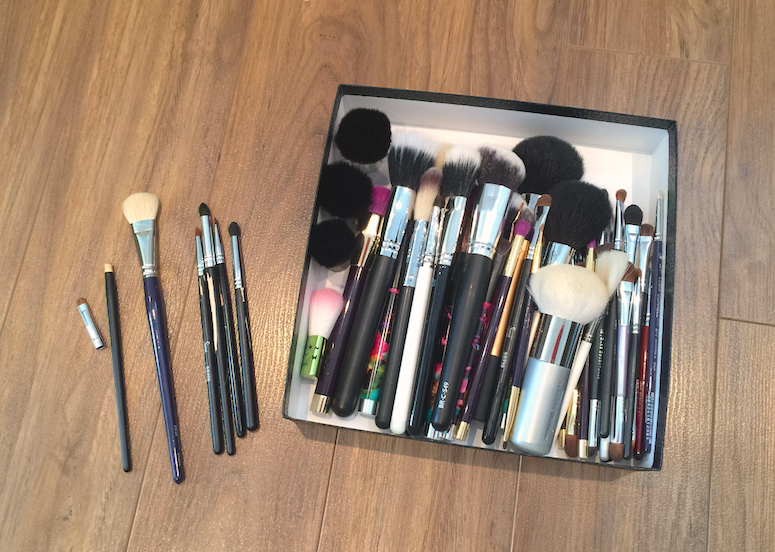 I generally love MUFE as a brand, though, so I was hopeful about the recently relaunched version and jumped on the chance to test run a couple. 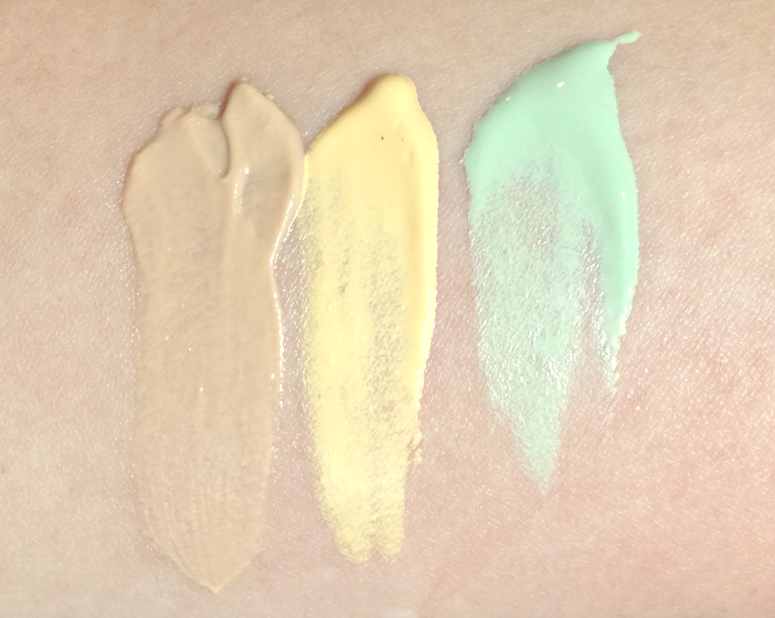 I've only tested three - the Redness Correcting Primer, Radiant Primer Yellow, and Smoothing Primer - so I can't speak to how the texture of each primer varies, but these feel rather similar to each other. The Radiant Primer Yellow and Redness Correcting have an identical texture: lightweight and a bit creamy, but with that disappears-into-the-skin finish that is the hallmark of a sophisticated silicone formulation. 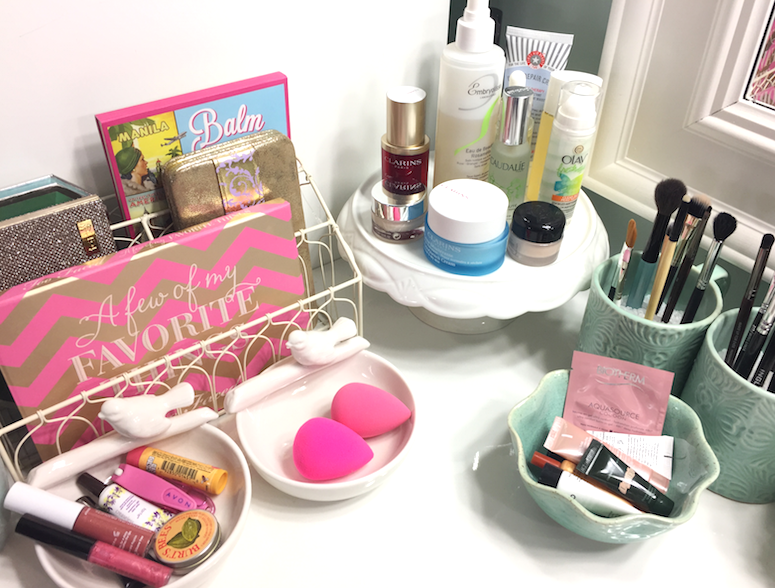 The Smoothing Primer feels a bit thicker, and reminds me of the Benefit Professional - which makes sense, since it needs to have a bit more weight to smooth down those pores and rough edges. It does a similar disappearing act, however, and bypasses that gross, overly slippy feel of the Smashbox type primers. I would say the colour correcting is fairly subtle. (It's primer, not concealer.) 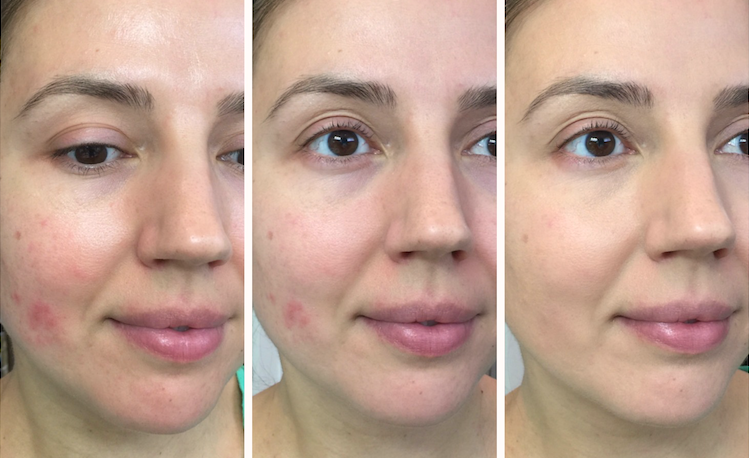 The Redness Correcting does indeed tone down the redness, as does the Radiant Primer Yellow, to some degree. I do prefer the latter, however, as it also boosts the warmth in my skin, whereas the green tinge of the former emphasizes the olive tones. With foundation overtop, it's not a huge deal, and if you really prefer to negate the redness and aren't prone to looking sallow, the Redness Correcting Primer will probably be your pick. The Smoothing Primer does reduce the appearance of my pores, and helps to minimize the texture of skin around blemishes. It's not quite photoshop, but it definitely helps to create a more even base for my foundation. It also mattifies slightly, though it doesn't control oil much better than any other primer I've tried. What I especially like about all these primers is how smooth and soft my skin feels after applying them - not tight or flaky, like some primers can leave it feeling. 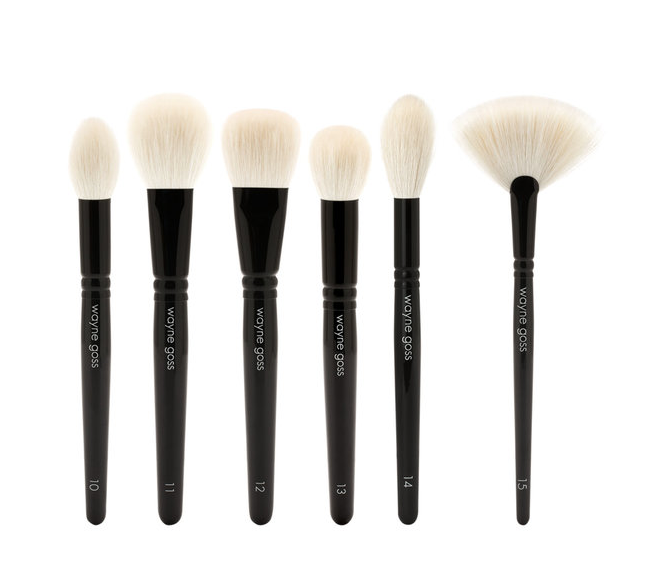 All of them are excellent for getting foundation to apply super evenly, and it nudges up the time-frame for flake-free, shine-free wear. And since it's hard to talk about the effects of a primer without showing some results, here's the stuff, on my face. On the left, my bare skin, with some moisturizer that was applied about 45 minutes before the picture. I've been having some kind of skin reaction to skincare samples I was testing (waaaaayyyyy too many at once, hence The Red Spot of Rage). In the middle, I have the Smoothing Primer applied to my nose, forehead and my inner cheek area. You can see the mattifying effect, and the way the pores are less obvious. 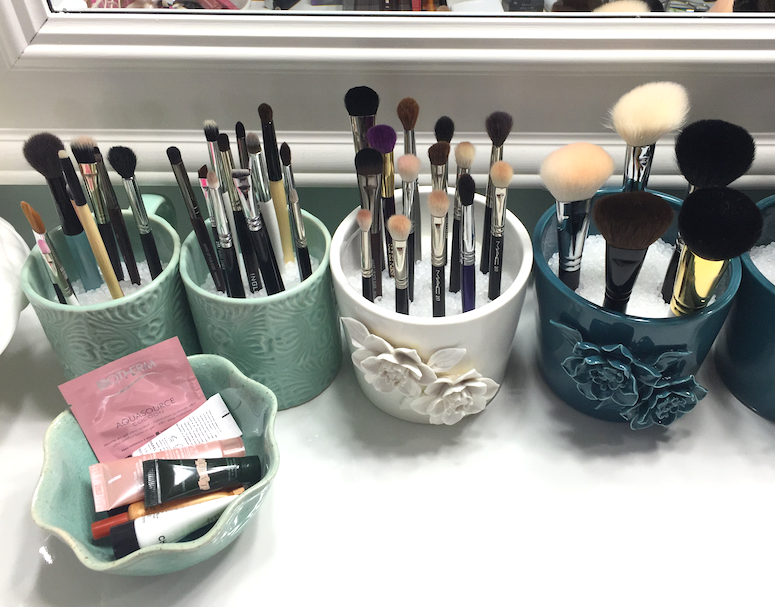 The slight texture in my undereye area is also softened. I used the Radiant Primer Yellow on my cheeks, jaw and chin, and some of the redness is attenuated. On the right, I've applied one layer of foundation (MUFE Mat Velvet, with a tiny drop of Ellis Faas to cut through the matte finish somewhat), with a bit more dabbed over the TRSoR. As you can see, the application is really smooth and even. 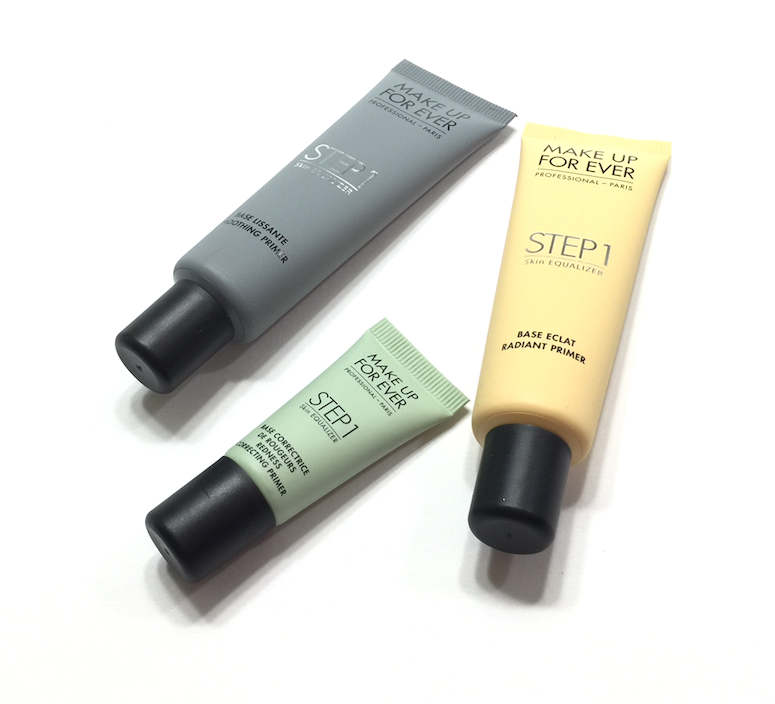 Are any of you trying these new primers out? What do you think? I'm quite tempted to give the Mattifying and Hydrating ones a go, down the line. In case you're thinking about making a Sephora order soon, you can choose between four deluxe sized samples with the code MUFESKIN (with a 35$ CAD minimum purchase, I believe). 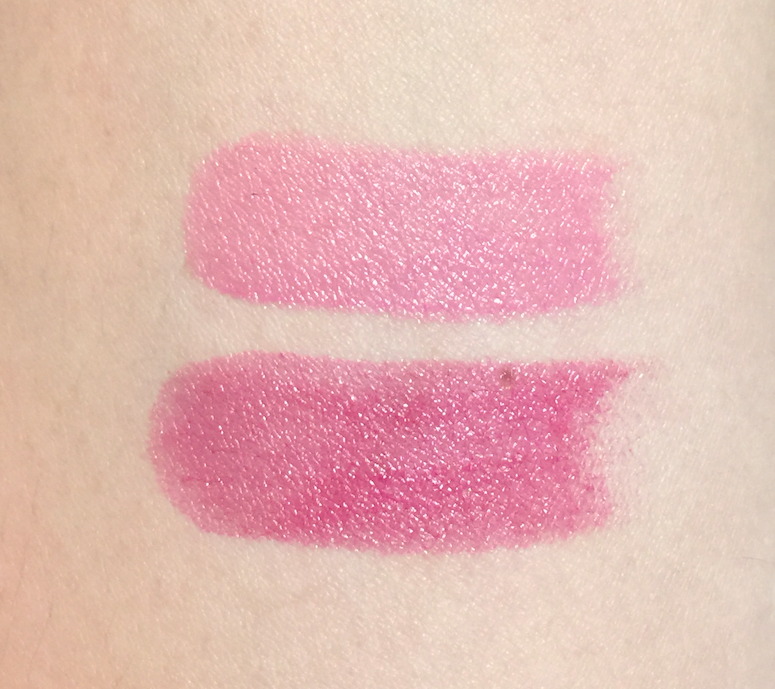 The Sheer Revolution Lipstick (26$ CAD) range from Urban Decay has been out for a little while, but I just recently got to try a few shades: Sheer Ladyflower and Sheer Obsessed. I've been pretty obsessed with either straight up balms or more opaque cream finish lipsticks, so these weren't high up on my radar. I'd heard good things, and I was probably going to snag a few, but I wasn't storming the gates for them. 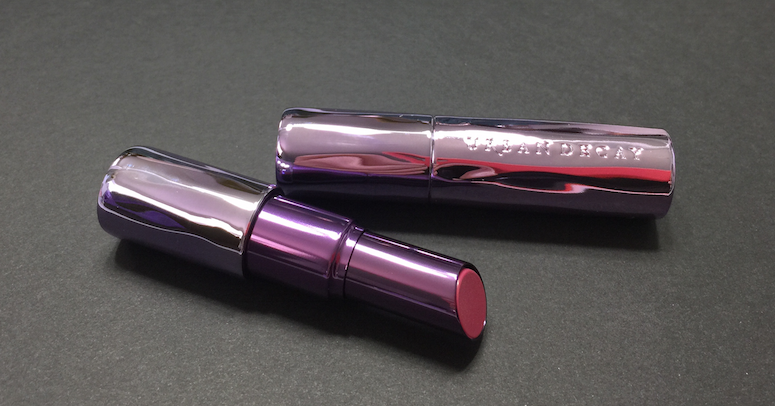 The packaging is similar to the regular Revolution Lipstick, with a fluid and relatively weighty metallic bullet casing, this time in a violet chrome as opposed to pewter. 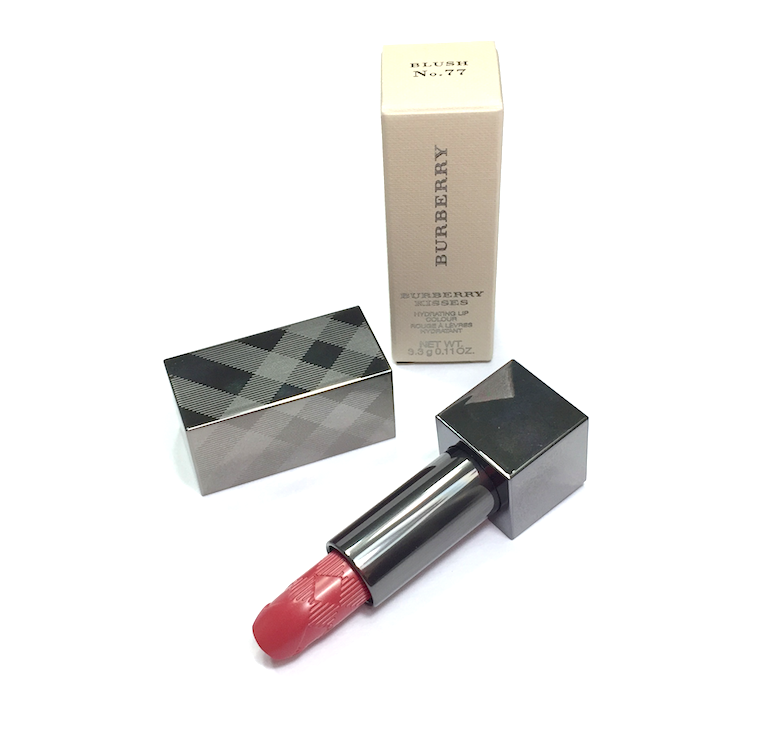 The formula is exactly as the name indicates, a sheerer version of the Revolution lipstick. Where those are creamy, rich and fairly pigmented, these are slicker, lighter and more translucent. 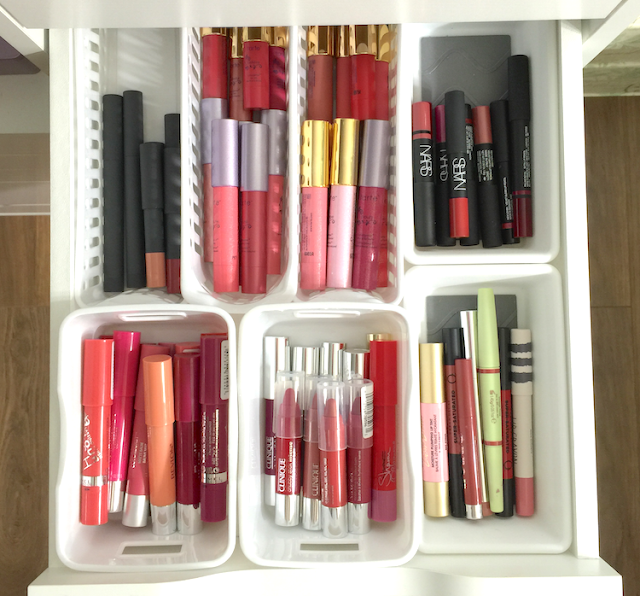 In terms of thickness of texture, they fall somewhere between the Estée Lauder Pure Color Envy Shine and the Lancôme Shine Lover lipsticks. They're super comfortable to wear, and though they have that slippy texture, I don't feel like they slide around on the lip. They actually have a bit of drag when applied, which surprised me. 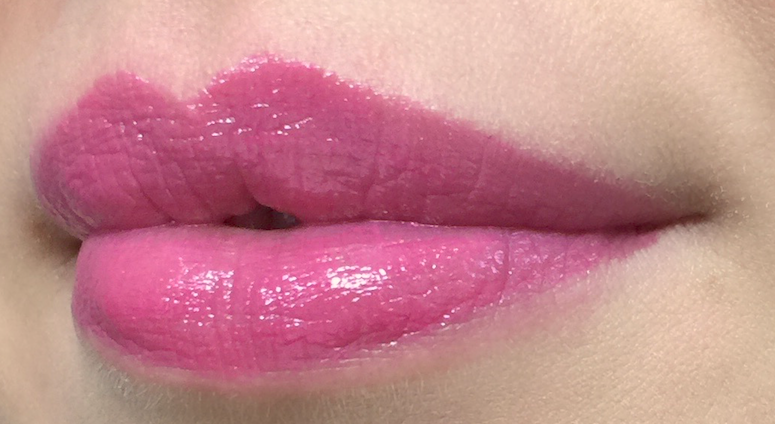 It doesn't make them difficult to apply, though, and actually helps keep to the contours of the lip without smearing around. I wouldn't say they're particularly hydrating, but again, comfortable feeling. They're quite shiny, almost juicy initially, but that settles. Wear time is minimal, however. I don't think I've gone longer than an hour and half without needing a touch up, so be warned that you may be going through that tube pretty fast. 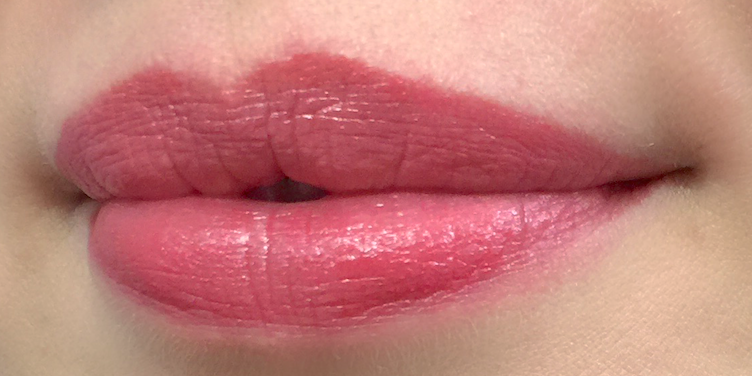 These didn't settle into lines or emphasize dry patches, and had the nice effect of smoothing out the lip slightly, either due to the shine or the more balmy texture. Sheer Obsessed is described as a candy pink, and it's definitely a light, cool toned pink with a milky/pastel tone. I don't think I would have ever thought to pick up a shade like this, as I would have assumed it would look too light or chalky. I think the translucency keeps it from looking stark. It almost has a bit of a lilac tone to it against my skintone, and it's just an awesome shade for spring. Sheer Ladyflower (LOVE the name, makes me think of that Medieval-set movie with Michelle Pfeiffer - Ladyhawke? ), on the other hand, is exactly the kind of shade I would have picked. 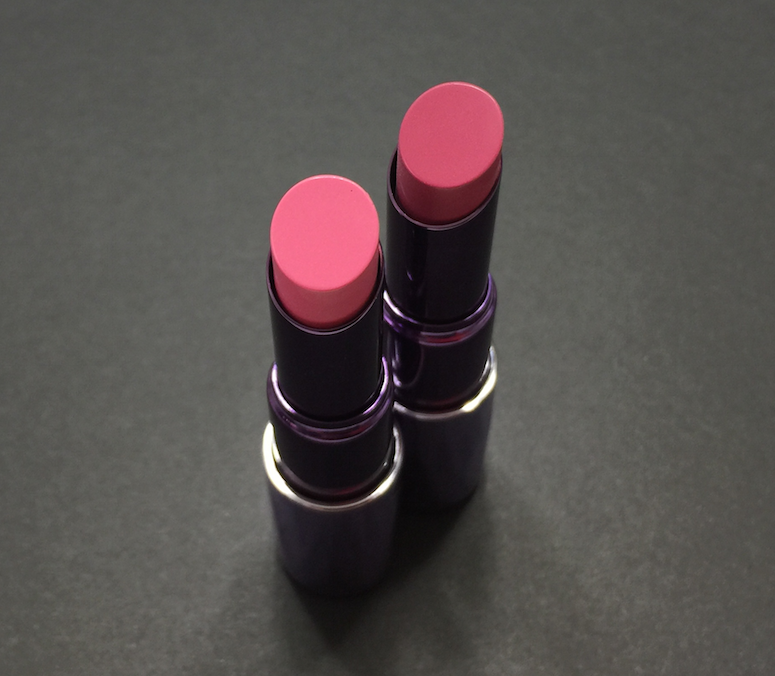 It's a cool-toned rosy pink, and again, super flattering. 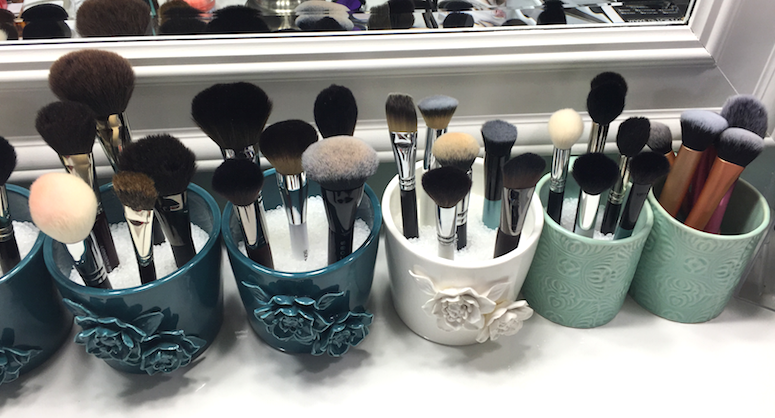 Have you tried anything from the Revolution range, either the original or the Sheer version? 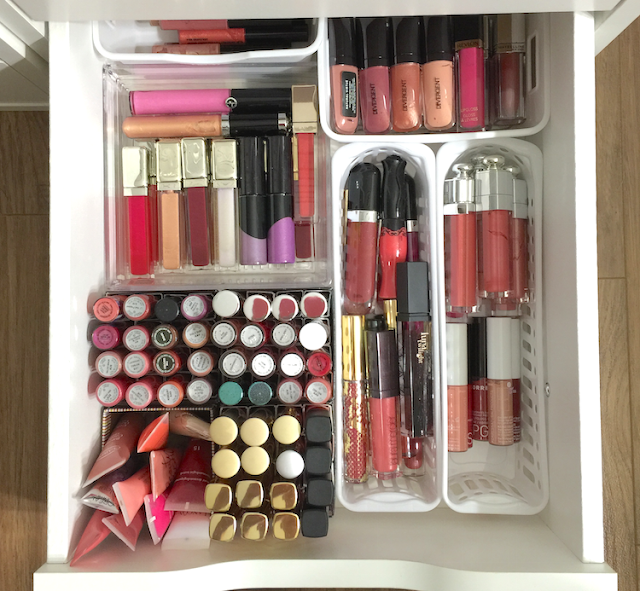 Are there any other sheer type lipsticks that you're currently crushing on? I've had the Ardency Inn Modster Manuka Honey Enriched Pigments (24$ CAD) for a few months now and mentioned them in a haul video, but I thought that they might deserve a proper review, what with the Made With Love sale going on over at Sephora. I'd heard a bit about this brand because one of my favourite makeup artists, James Vincent, is a brand ambassador. Paid spokesperson or not, James has a lot of integrity and I totally trust his standing up for this brand. 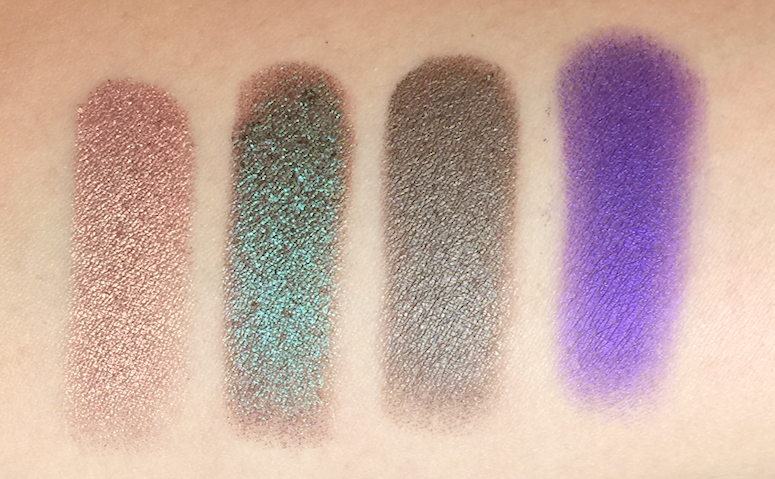 So I bought some of the eyeshadows (or pressed pigments, technically), and I am NOT disappointed. These are freaking phenomenal. I know that honey is a natural humectant, though I'm not sure how well that function is preserved when it's integrated as an ingredient in a pressed powder formulation. I will say that these are incredibly creamy to the touch, with a rich, smooth payoff that isn't too thick. They have a very playable texture, so they're easy to work with, blending almost by themselves. 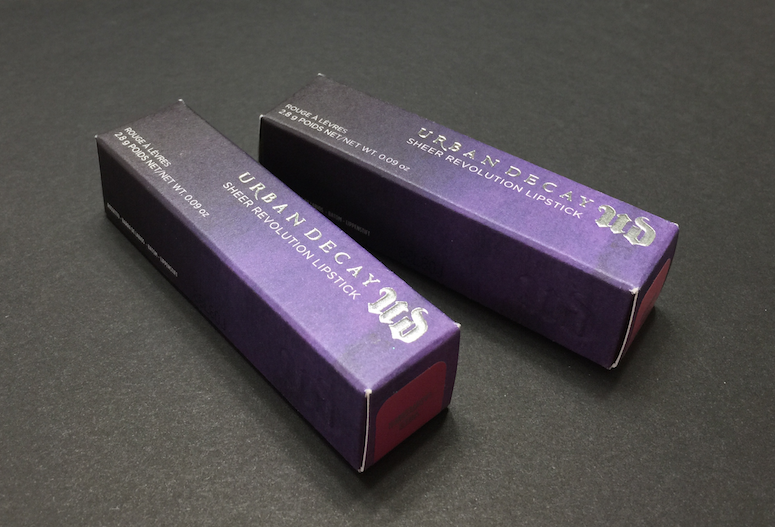 The copy claims that these have up to 78% pigment and high grade silicone waxes for long-lasting wear. I do think the pigmentation is fantastic, especially for the shades I've selected (there are a few that are more sheer with a sparkly finish, such as Disco). And over a primer, I didn't have any issues with fading or creasing for over 10 hours, if not longer. The actual colours are awesome as well. Rose Gold is a slightly "dirty" variation on the theme, so it translates well to a more deconstructed, rocker look, as opposed to something necessarily pretty and polished. Peacock is one of those teal/red-brown ducochromes that I had to get, even though I own several iterations of the theme. 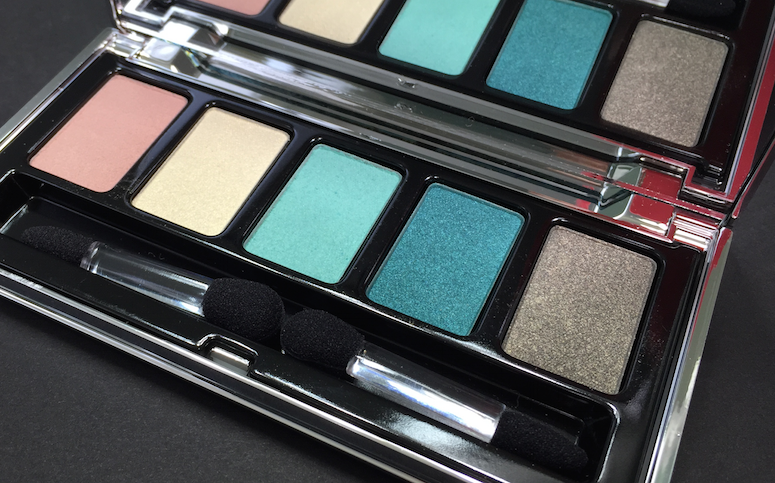 I will say the green in this is much deeper and emerald-like than in any of the other eyeshadows I have. Hell is really complex and hard to define - sort of a khaki grey-brown with a slight red undertone? It's insane. And fabulous. Royal is what I'd consider a "hot" violet - purple with deep pink and blue undertones, and super intense. 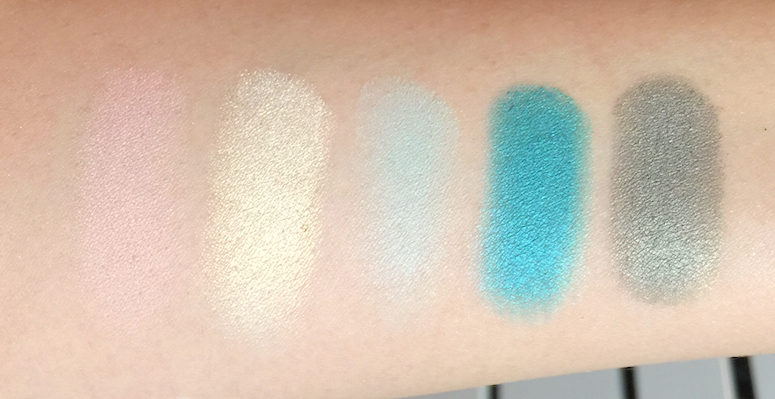 It has a thinner texture than the other three shades here, but it doesn't lack in the pigment department. If you're looking for a purple that maintains its vibrancy and doesn't wind up looking murky, this is it right here. Rose Gold, Peacock, Hell, Royal. And how they look actually applied: I used Rose Gold in the inner two thirds of the lid and the inner half of the lower lash line, and used Hell through the crease and the outer third of the eyelid and outer half of the bottom lash line. Super simple, a little grungy, but still chic, I think. They blended perfectly, I really didn't have to do much work here. 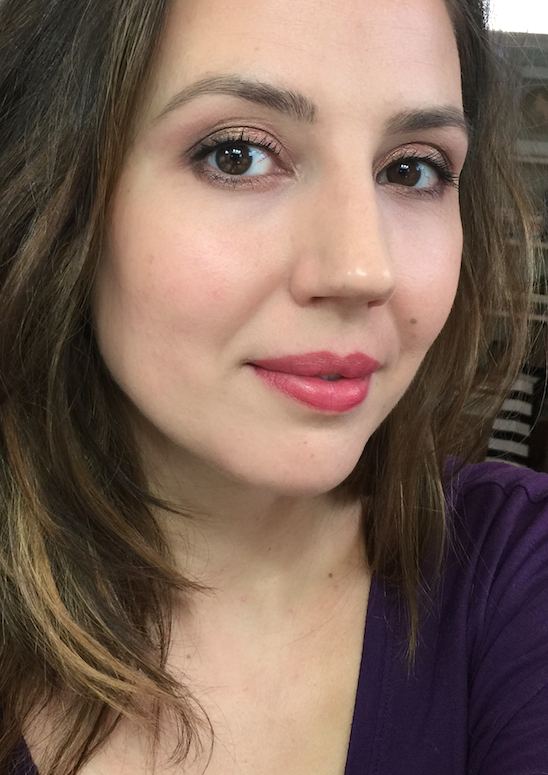 Here I just added a plum liner from Tarte to the bottom lash line, and slightly intensified the crease color. 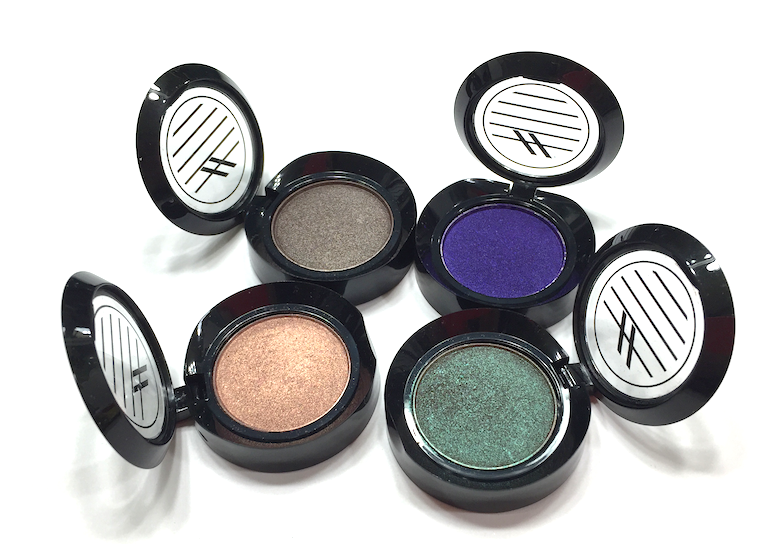 Have you guys tried the Ardency Inn line yet? 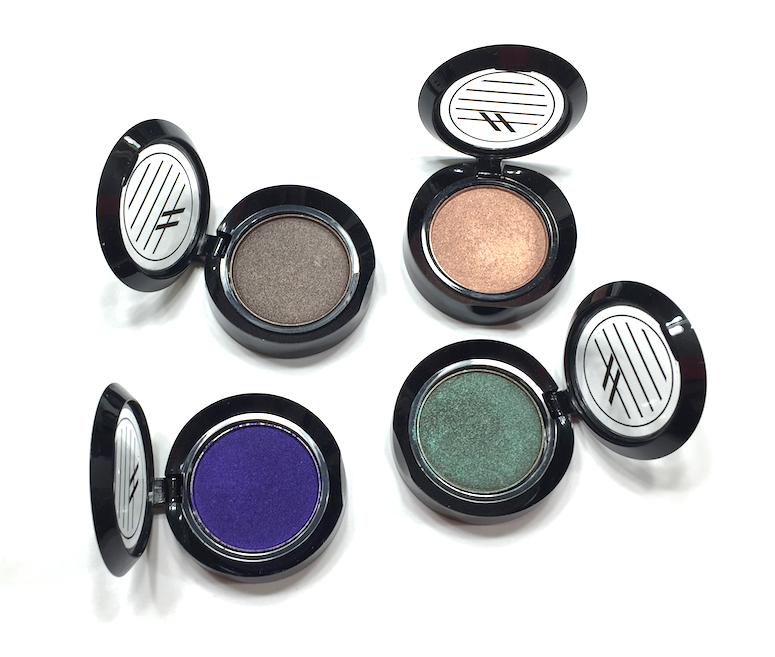 I really want to pick up more of the eyeshadows, but I'll probably wait for the next Sephora sale in the Fall. I can't say I'm super intrigued in the other products in the line, though. Maybe the foundation (which is a concentrate that can be mixed with other mediums), but I have a feeling Cover FX probably nailed the concept better. 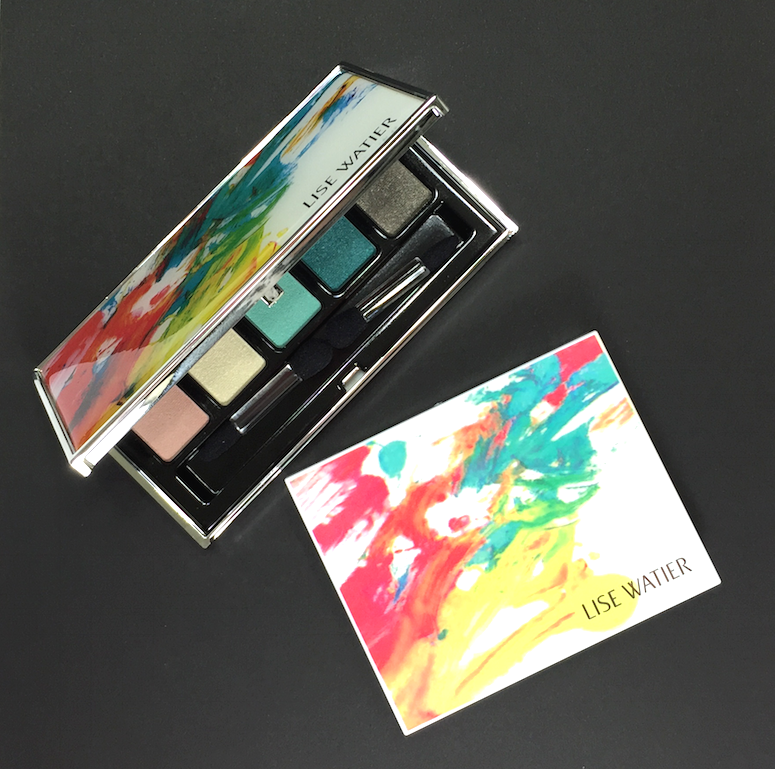 So here's one last hurrah for the Lise Watier Expression Spring Collection, as summer waits in the wings. 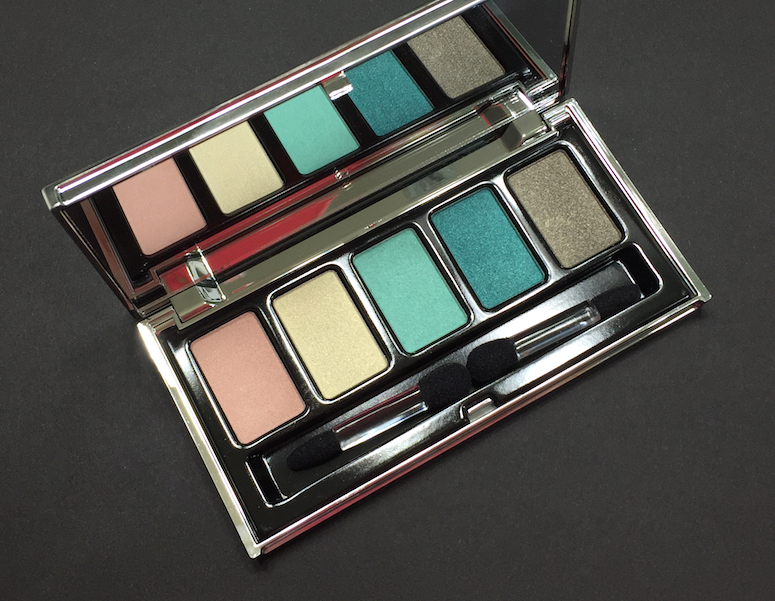 The packaging on this collection was a vivid splash of colour, a bit of playing around on an artists palette (and totally connecting with the desire to see some bold, beautiful shades after a grey, dreary, never-ending season). 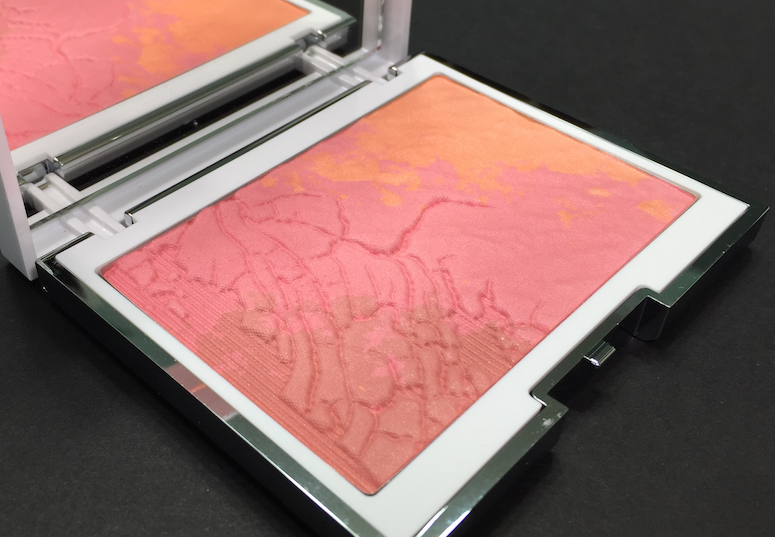 Doesn't this blush look like something you'd see from a plane, flying over the southwest United States? So pretty and original, but still graphic and unexpected (read: non-floral) for Spring. 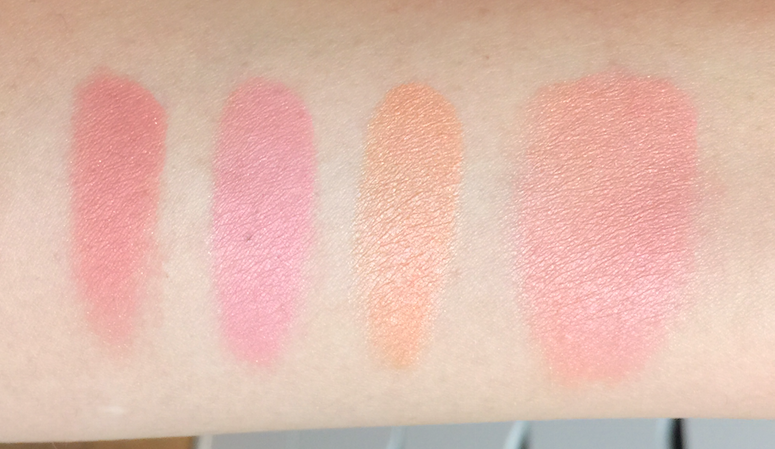 The three different shades of the Expression Blush Trio (38$ CAD) are a little tough to separate out, and I tend to either focus my brush on the right side for a more coral-peach look, or more on the left for a warm pink. 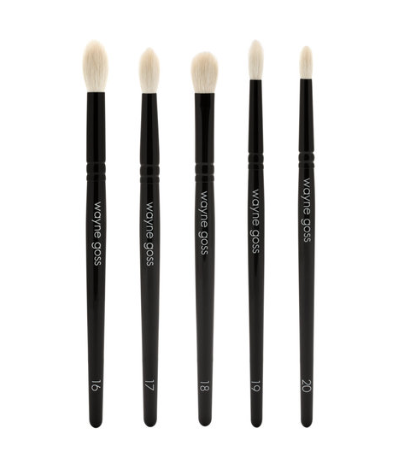 The texture is soft and velvety smooth, and actually a bit powdery when picked up with a brush, but it looks very natural and texture-less on the cheeks. 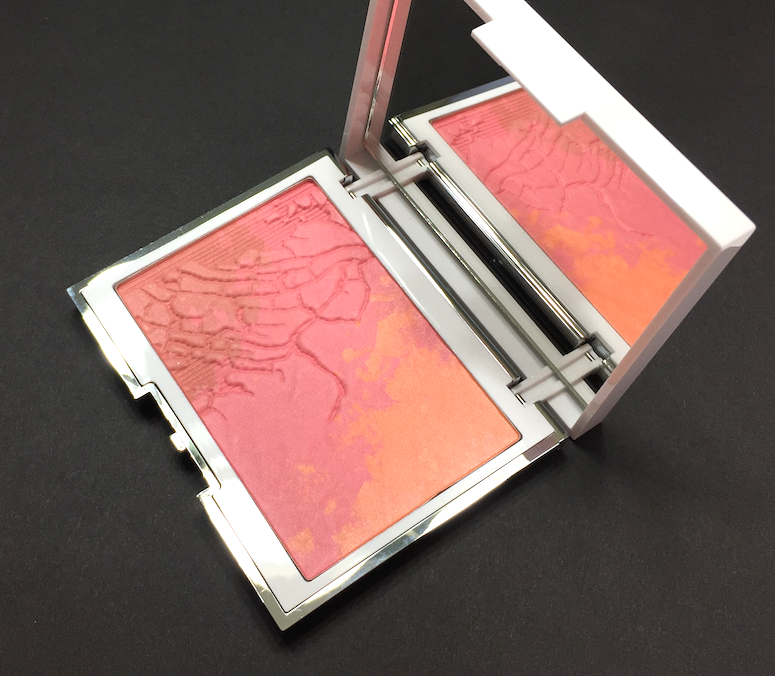 It has some sparkle in the pan and a bit swatched, but comes up as gently glowing on the cheeks. Very flattering, and almost more of a summer type colour, at least for me. 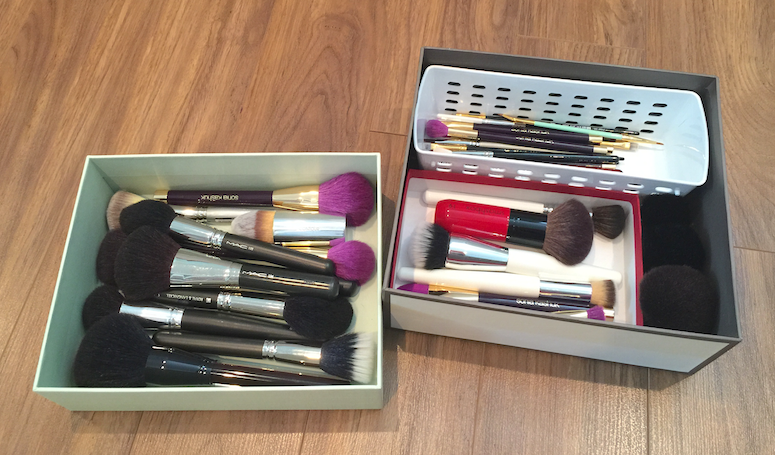 It can be built up very easily for a punchier look over (faux) tanned skin. 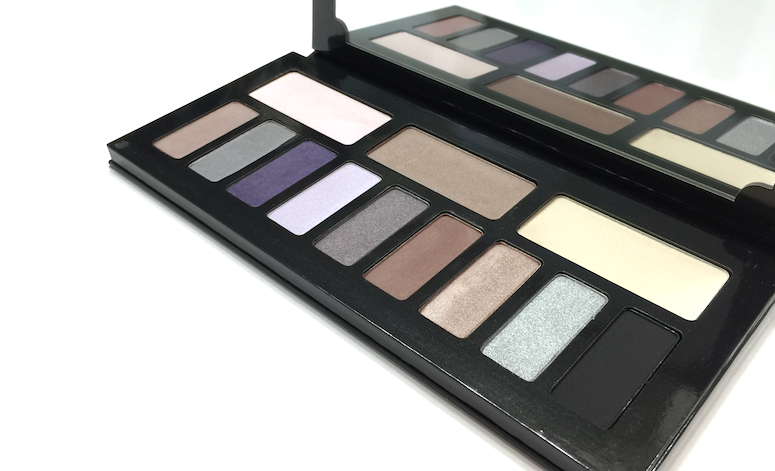 The Expression Eyeshadow Palette (42$ CAD) just delighted me as soon as I opened it. Combine teals and olive greens, and you've made me the happiest camper. 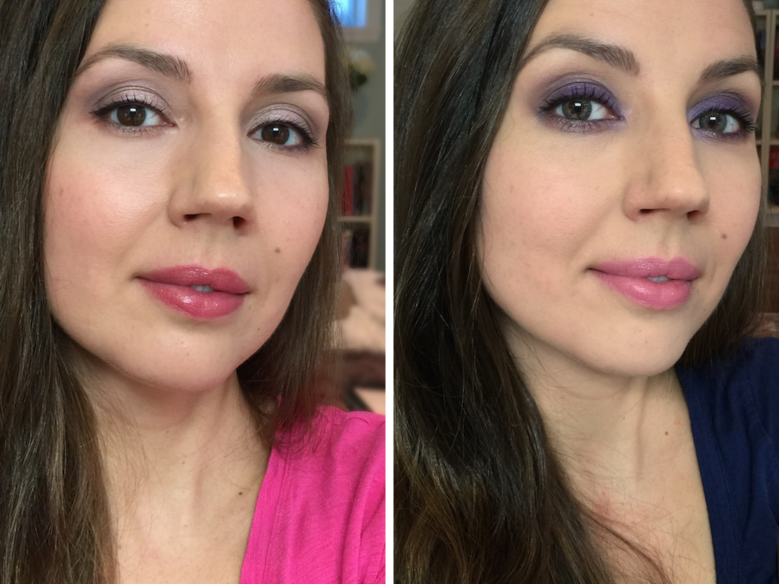 That said, I don't think this palette actually works all that well by itself, unless you happen to like pastel eyes. 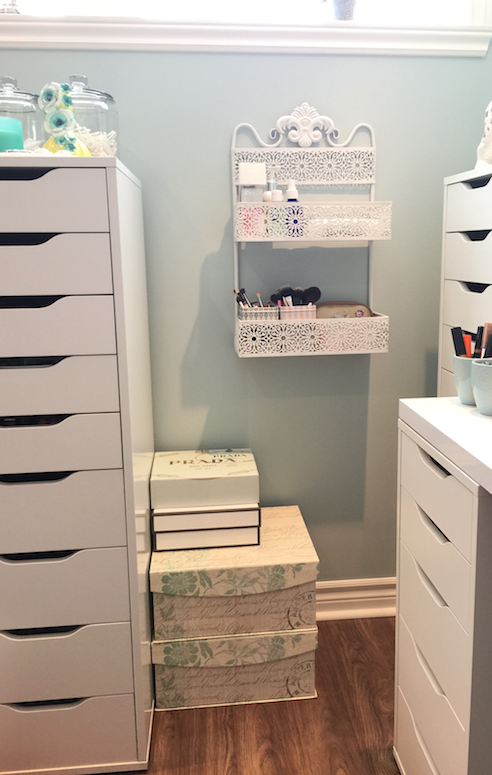 But it's perfect for integrating some much-needed colour and pairs well with the embarrassment of neutral palettes I have in my collection. The formulation here is the same not-quite-cream-not-quite-powder that has been featured in the last few limited collections. It feels really plush to the touch, and some of the shades swatch especially nice, but I find the application can be a little tricky, at least as far as blending the colours together goes. Sometimes they don't buff out or build up particularly well (the mint green was particularly troublesome in this respect, remaining sheer and almost chalky), but they do look amazing once on the lids, with a glow that's not overly metallic or shimmery. 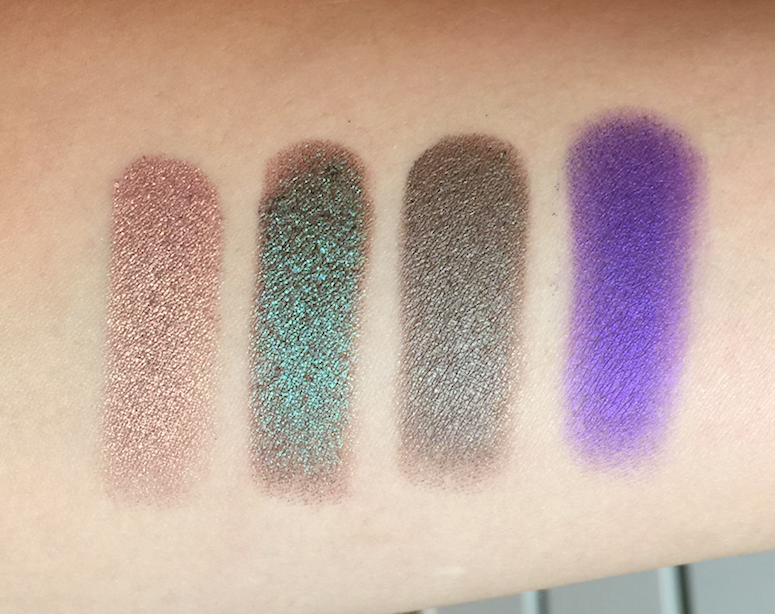 The teal and the olive are by the far the standouts in the palette, and I would easily buy those as singles. The mint is the weakest, as I said, and the peach is almost a little dry and faded when applied. The gold is oddly chunky, kinda thick to apply, but is works as a highlight. Lasting power is average/good, maybe 7 hours before I see some fading (over primer). 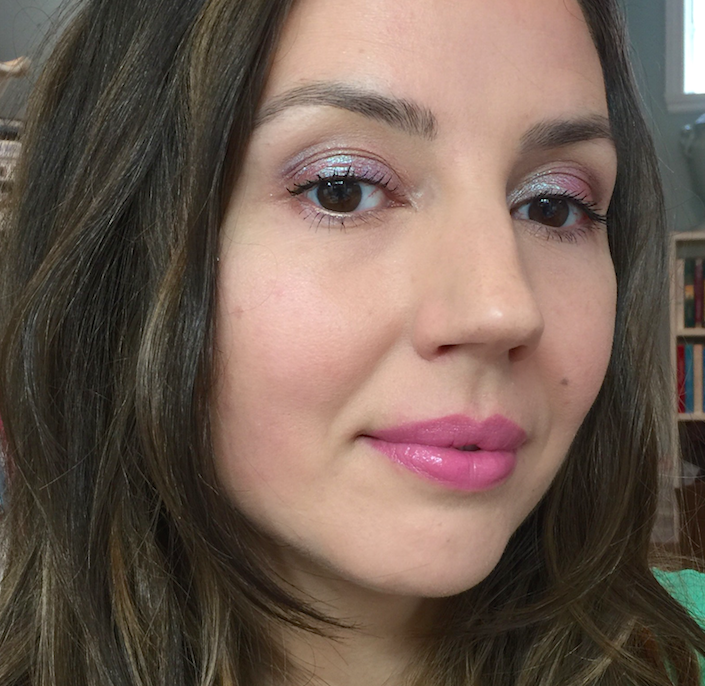 This is a fairly simple but bright look using the palette, and a barely-there application of the blush. 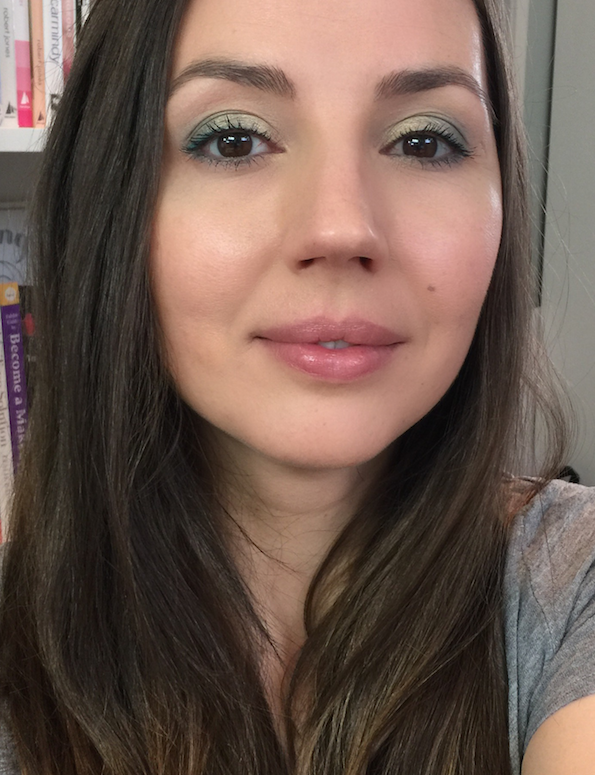 I managed to use all the shades on the eyes, going from yellow on the inner corner, through mint and teal on the lid to the outer corner, with the olive deepening the crease and smudged into the lash lines. I used the peach very lightly as a transition shade. 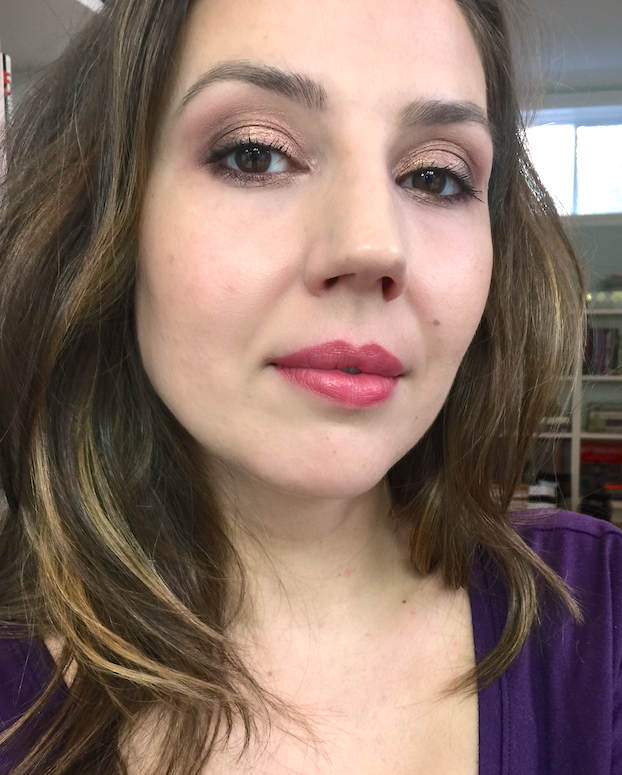 So at this point I pretty much auto-buy anything Kat Von D. There have been some misses, certainly (the mediocre Holiday palette, the underwhelming lipstick re-launch), but more often than not, I dig it. And honestly, KVD herself is growing on me, even though she has had some equally unfortunate missteps (see: her gross affair with Jesse James, the "Celebutard" controversy). She just seems so grounded and actually sweet in her tutorials, and genuinely passionate about her brand. Her instagram is also chock-full of interesting bits about art and literature, which is not at all what I had in my head about her. 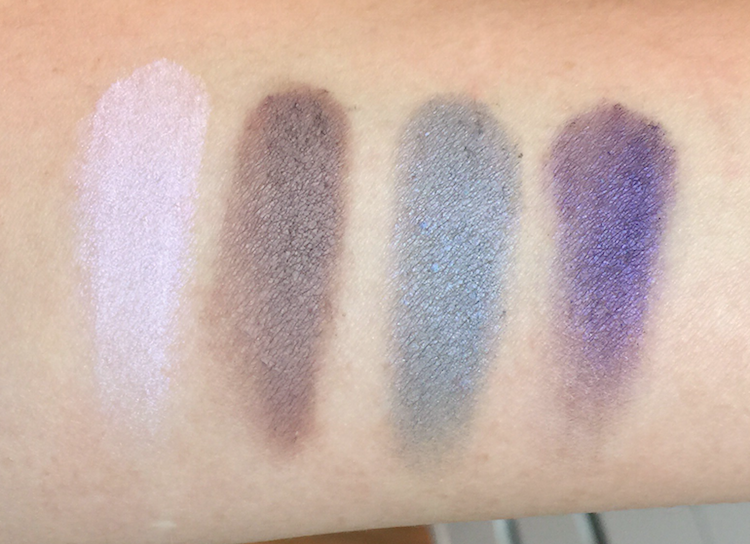 On to the Interstellar palette (55$ CAD at Sephora). Pretty, right? I love the groovy packaging design, and I was drawn to the cool-toned, neutral-leaning shades, balanced by a glimmery lilac and vibrant eggplant purple. Performance-wise, most of the shades are spot-on with the quality I've come to generally expect: soft, creamy, not overly dense, but well-pigmented and blendable, lasting a work day over primer without fading. But there are a few exceptions. 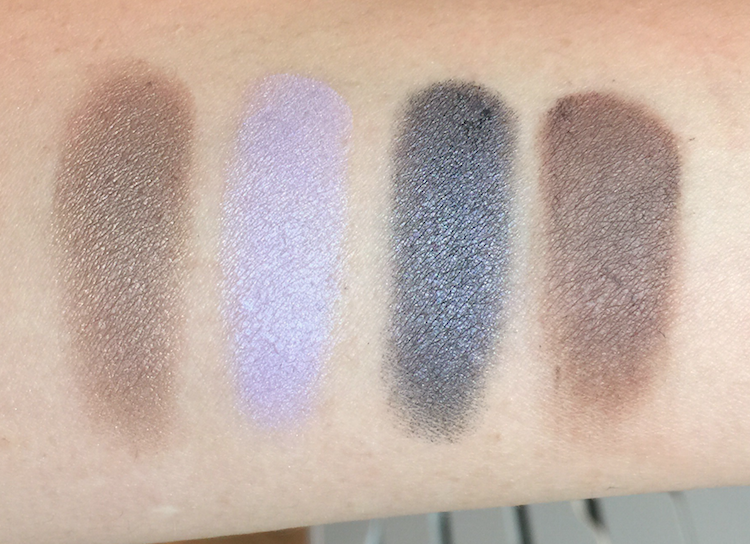 The most iffy shades are actually in the first "quad" in the palette. 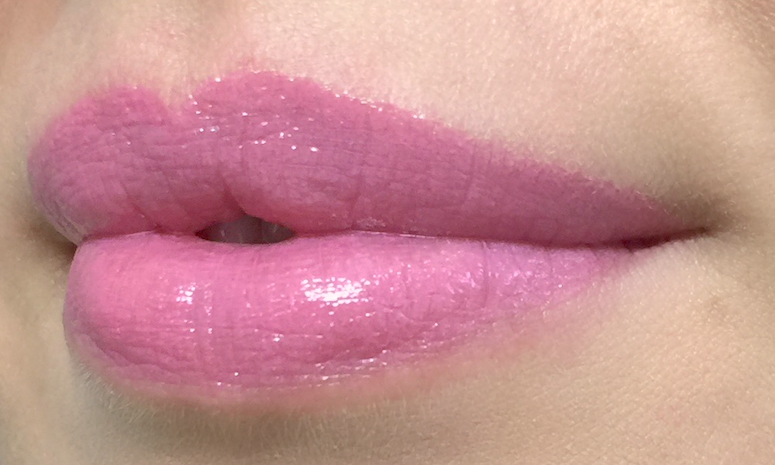 The ice pink being a bit sheer and powdery, so while it's not a shade that I'd apply over a larger area, it works for the tear duct area, and has enough iridescence to add a duochrome flash to a colour layered underneath. 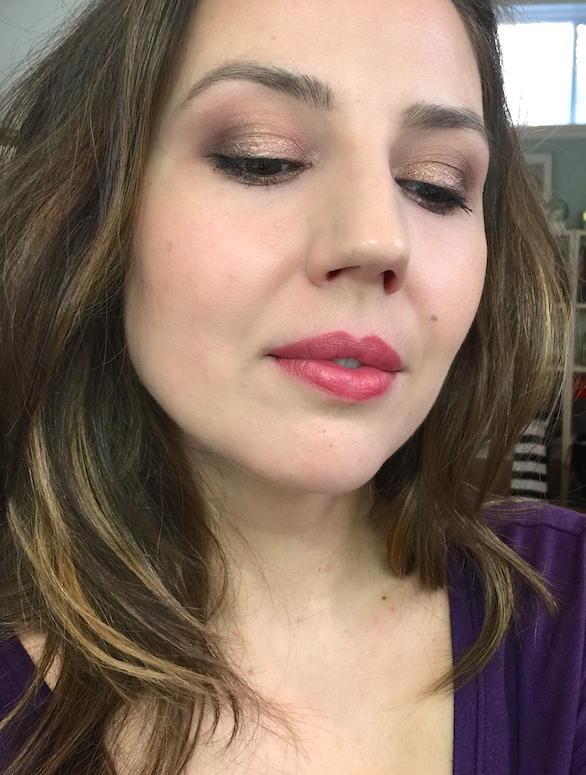 The cool taupey/plummy brown is great, an easy satin-finish shade that's perfect for the crease. The shark-grey is maybe a bit sheer as well, but otherwise lovely. The purple, however, was my biggest disappointment. It has super choppy payoff, and fades out like you wouldn't believe. 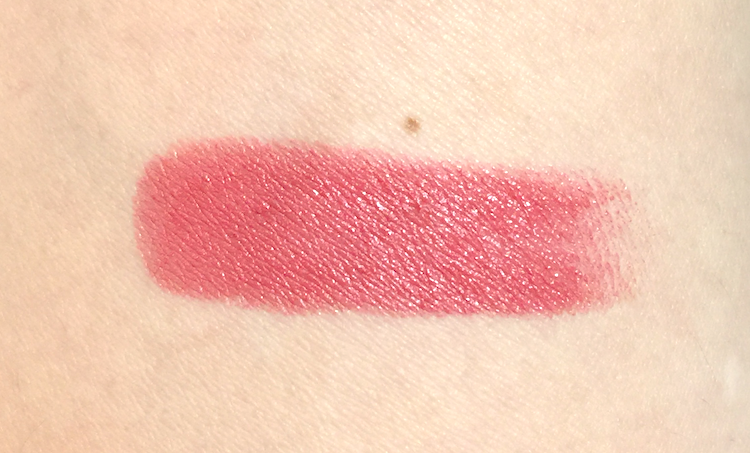 To get it to show up on the eyelid, I had to use primer AND concealer AND a setting spray to wet the brush, and it still showed up more ashy than it does in this swatch. If you're buying the palette with this shade in mind, don't. There are definitely better options out there. But then if you're in it for the cool neutrals, you have some great ones in the middle quad. All of these are beautifully textured. LOOK AT THAT PEWTER. The lilac is gorgeous as well, especially layered over the gray. 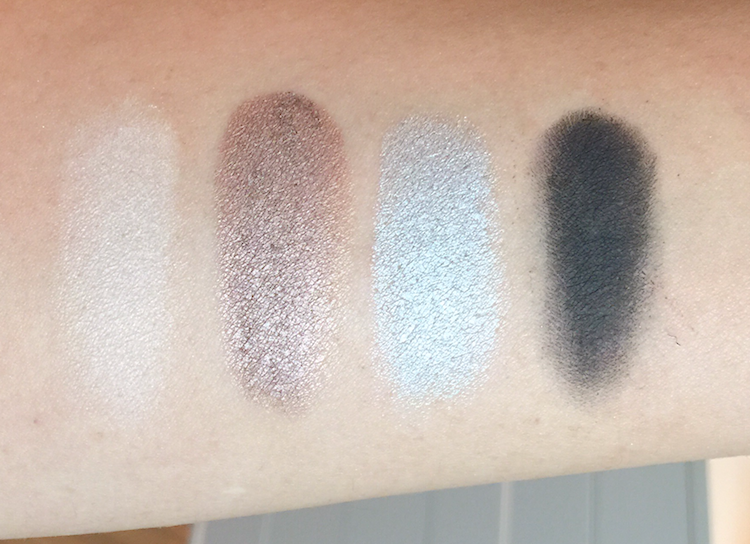 The final quad is good too, with the vanilla satin being the weakest, but for a brow bone shade it's actually just right, as it blends out the transition shade without adding extra frosting. The shimmery taupe is perfect, and the silver is out-of-control pigmented, definitely the richest feeling shade as well. The black is about average, pigmented but a touch choppy, but nothing daunting. 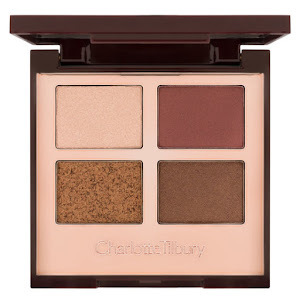 The purple fail and a couple of quibbles aside, this is a sweet little palette that could fill a hole in your collection if you need cooler tones, especially those mid-toned crease and transition shades (seriously, FOUR taupe/medium brown shades here, albeit all with different textures and finishes). 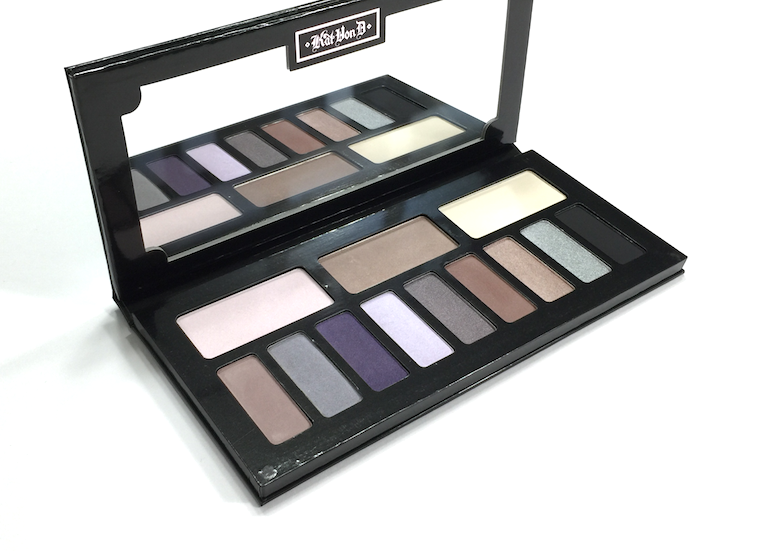 It's probably not one I'd recommend as a starter palette (not quite enough variation, since everything leans to one side of the spectrum, and heavily favours the medium shade range), nor would I urge the serious makeup aficionado to prioritize it, since they'd probably have these types of colours already. 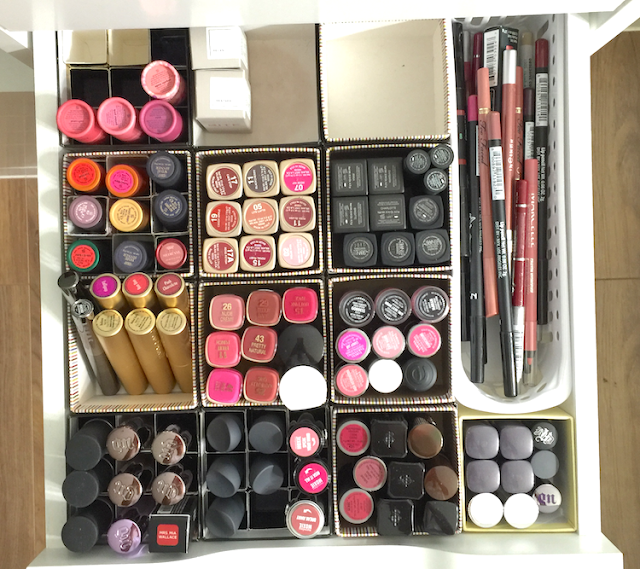 If you're a KVD collector, on the other hand....well, I don't have to convince you, since you probably already do have it. My personal feeling is that I probably loved it a lot more initially, but that bust up with the purple broke my heart a bit. 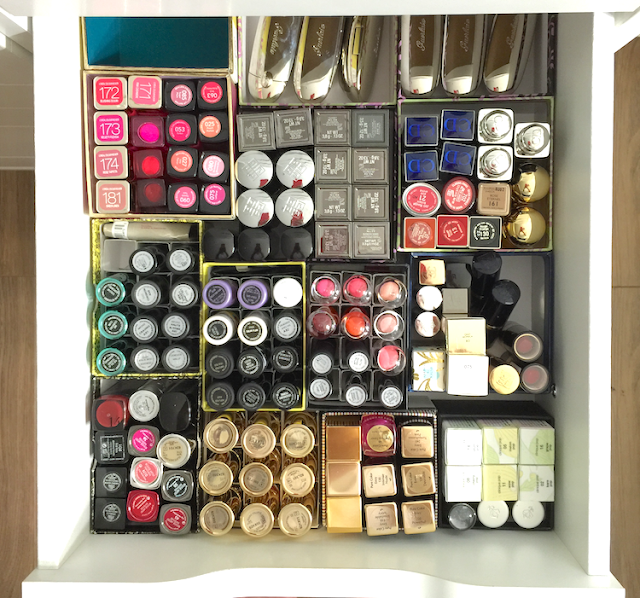 That said, I do find myself reaching for it quite a bit when I'm looking for that perfect crease colour. 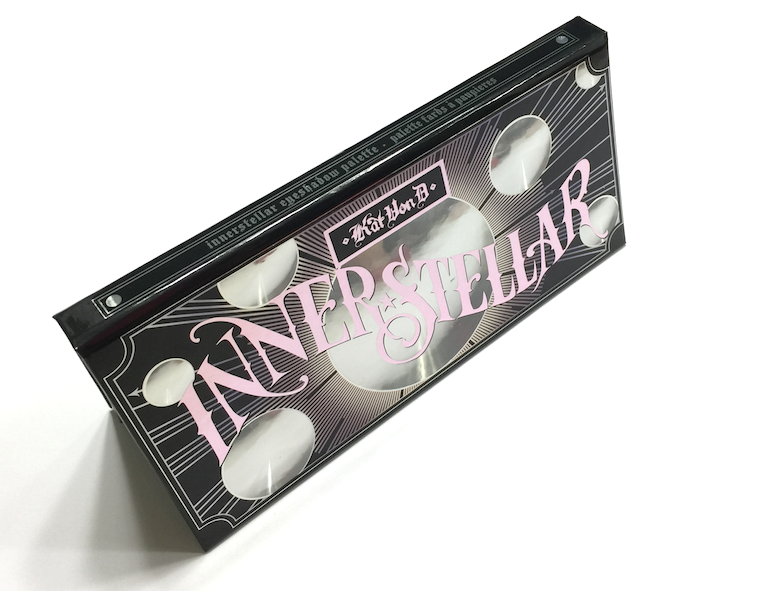 Have you guys tried Interstellar or any of the other KVD palettes? What do you think of her line in general?